LED lighting power source for 3 each 18 inch Pass and/or Obs O gauge cars. Hi Guys. Off the wall inquiry and way out of the box also. Up front, I'm enhancing my desk top. I have a very nice decorated office area that I spend a decent portion of time on my 2 computers both for bus. & my time. 2 work desks also. I now have a Strasburg, SF Atlas O and a 3rd rail SM Obs car on my desk top sitting atop of a piece of GG track..
My wants. To light these three units. I shall use Gunner's Kits in two of these units. I shall contact Scott concerning current usage on the SM. Thus said, I feel sure I shall need a AC input for these three units. From there I think I need to convert to DC with the correct amt. of volts and amps to light my three units. Please note, only 3 units with a 18" (more or less) string of LED's + the AC to DC step down. Starting questions. 1. input ac voltage? Step down unit from ac to a variable dc. A ac supply unit small enough to cover my amp usage. 3. How many amps will I need if I use DCS voltage. NOT A XFORMER. Best regards. I'm tired so I will let this simmer for awhile. Well, for the lighting kits I supply, any power AC or DC from 12 to 18 volts will be fine to operate those. I'd probably consider a cheap wall wart, you can find tons of 12-18V DC ones on eBay for a couple of bucks to start. The two with my kits in them can both be powered with less then 100ma. You may even have a brick in your pile of unused power bricks, I save them when a device craps out. I'm with GRJ on this. You probably have a suitable DC-output power adapter (wall-wart) lying around...or for a few bucks on eBay...much less $ than an AC-output adapter for the same Watts of power. 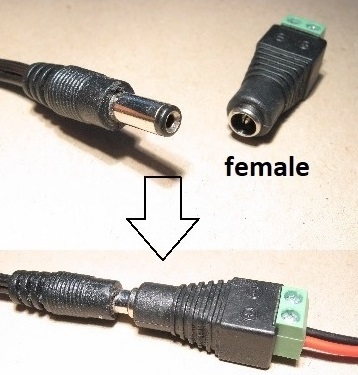 Most wall-warts have a coax/barrel plug - you can get an adapter (less than $1 on eBay) that converts the barrel/coax plug to screw-terminals so you don't have to cut/splice the wiring.